A self-taught gardener who grew up alongside the sweet-smelling orange blossoms of Southern California’s citrus groves, Kathryn Agresto inherited her father’s Belgian flair for fine food and entertaining. She loves growing fresh food, cooking, and eating. As founding owner of Native Soil Gardens, Kathryn has been designing edible gardens for restaurants, corporations and residences for nearly a decade. She first put her passion into practice with the creation of Park Ave's culinary garden, which earned rave reviews by customers and Orange County foodies. The result was an impressive, high-yielding, beautiful culinary garden that included 14 raised beds. The extra deep beds are planted with a variety of cut-and-come-again lettuces, carrots, radishes, artichokes, squash, melons, cucumbers, tomatoes, herbs and more. That effort spawned press attention and supported the Orange County movement in the farm-to-table dining scene. Her intent is to support a Chef's creative approach and vision to cuisine with homegrown natural produce. She cultivates innovative varieties of vegetables and herbs for use by chefs and mixologists. Kathryn has gone on to design several production gardens for local corporations and home kitchen gardens for local Orange County foodies, including restauranteur and cookbook author Zov, OC Register Food writer and cookbook author Cathy Thomas, and Blue Water Grill owner Jim "U." Montage Laguna Beach hired Kathryn to work with Executive Chef Craig Strong to create and manage a multi-faceted edible garden, with herbs, fruits, vegetables and flowers that support the signature Studio Restaurant's gourmet cuisine and cocktails, as well as the resort's select spa treatments. 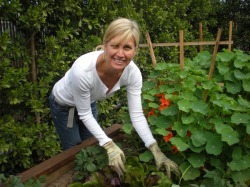 Kathryn uses the organic biointensive method of gardening. She believes that to have a healthy garden, first and foremost, you must have healthy soil. Beds are double-dug (extra deep). This aerates the soil, giving the roots plenty of space to grow straight down, improving water retention and allowing a healthy growth of microorganisms. 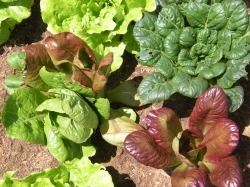 Soil health is maintained with natural compost. Close spacing of plants increases the yield and creates a vibrant mini-ecosystem under the canopy of leaves. Companion planting and IPM (integrated pest management) is used to attract helpful insects and repel harmful ones, and planting items in rotation helps maintain soil health. Kathryn is passionate about creating garden spaces that not only are productive but visually beautiful and exciting to all the senses.